Even for an enthusiastic history teacher like me, the idea of conducting a class in which students learn generals' names, gruesome casualty numbers, and mark battle locations on a map seems a bit dry. Without added meaning, facts alone do not generate real thinking. 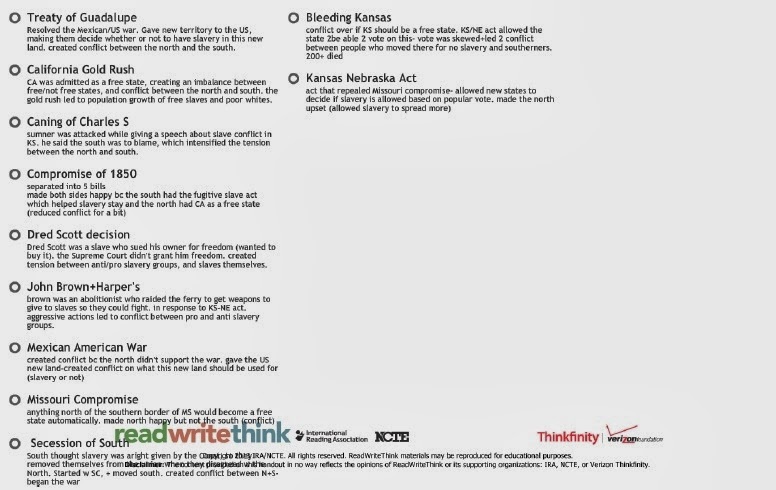 It takes time to look up the factual information that, taken together, can help students understand why one side won and the other side lost any given war. In our case, it was the Civil War. Students would rather work together than trudge through the facts alone, and I would rather help them learn to collaborate with one another. With this strategy, they learned about the major battles of the Civil War quickly without having to tediously look up all of the dry names, dates, and numbers themselves. They saved the information in their Evernote or Google Drive notebooks right on their devices as they carried out the scavenger hunt. Of course, I wanted them to gain an even deeper understanding of why the Confederacy dominated in the East early in the war, while the Union dominated in the West and on the sea throughout the war. Padlet made that possible. After everyone finished the scavenger hunt we used a website called Padlet to post answers to specific questions we were asked. Padlet was an easy way to see everyone's ideas and it was helpful to answer the essential question of the lesson. After we had finished what we could of the scavenger hunt we emailed each other notes on the battles we missed and further joined forces to reflect and analyze what the answers were to the Essential Questions based on the combined effort research. This collaboration was done technologically using Padlet, a site where you can post computer-generated sticky-notes on a virtual wall. With their combined knowledge, students were able to answer complicated questions. They did it all themselves. I didn't give them any answers. And they were proud to have done it together. Of course, in the end, I wanted them to write about what they'd learned individually so I could check that each and every one of them had learned the content goal of the lesson. But the collective depth of understanding was more impressive than in previous years and it's because of collaboration students were able to achieve. Plus, it was more fun! The battles scavenger hunt was another new and fun way to present the information we've been learning in class. It's always nice to be able to do something that's enjoyable that is also different from traditional teaching methods. The way in which we did the scavenger hunt was fun, and barely felt like work at all. Overall, the scavenger hunt was an interesting but exhausting way to discover new information about important of the Civil War. I'm sure this activity could be used for other wars throughout history, or even for any series of facts that students need to learn but can be dry to teach or read about on their own. It's a great opportunity for a class to come together and create something fun while learning. Three different events happened in my classroom this week that signaled to me that my students have reached a critical stage of learning: they are comfortable with change, with being asked to do things and think in ways that are unfamiliar and difficult, with struggling through a process in order to reach a goal. I asked one of your students if using his phone in class all the time was ever distracting because of the text messaging and gaming that is available. He said, "No, I don't have time to get distracted in here. I'll miss something." This student understands the power of his smart phone. It isn't just a luxury, or a messager, or a gaming device anymore. It is a tool that can be used academically and professionally to accomplish great things. On their class blogs, many students recently commented on how one particular project was time consuming and how it took patience and trial and error to learn the technology needed. But those same students mentioned that they came out on the other side of the project with a completely new understanding of the history. Making an infogr.am was a long process. It included analyzing the documents and the many facts and statistics they included, deciding which were the more relevant to incorporate, and figuring out the best way to format and present them. However, the entire process helped me understand the situations faced by the Union and Confederacy at the start of the war. 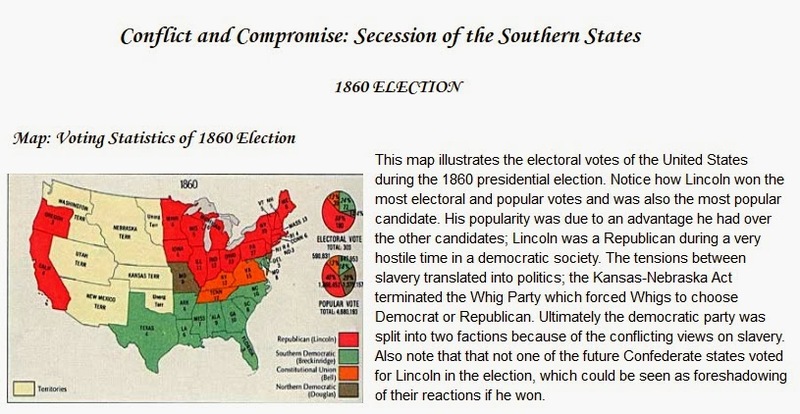 After viewing the documents, I realized the considerable edge the North had over the South when it came to resources, the economy, transportation, the government, and the population available to work and fight. I felt that the infographic was good at showing this material and helping me understand it, but I also felt that it was hard to put this information into an infographic, especially with the program we used. As a result of the activity, I learned how much more people, money and resources the North had compared to the South. They had a clear advantage, and it was especially apparent when placed upon a graph. After reading these honest reflections, I made sure that I told them publicly as a class that I knew this particular assignment was a struggle and that I was proud of them for pushing through it. The historical analysis they were able to do and the lessons they were able to learn demonstrated deeper thinking than I had seen from students in a while. I congratulated them and thanked them for continuing to persevere through unfamiliar territory with me. A well-respected colleague from within the district, Jennalee Anderson, came in on Friday afternoon to observe one of my freshmen classes. She was familiar with quite a few of the students since she'd had them in class a couple of years ago. She told me she asked them about the differences between a paperless classroom and other classes. Some answered that they felt more organized than ever before. The same students who gave her these answers today, in March, are students who were hesitant to go paperless with me in September because they claimed they "weren't good at technology." These are our youngest and least mature students, the ones most likely to feel overwhelmed by high school, yet they are understanding how technology is more helpful than it is distracting if used within the right structure and with intentional supportive supervision. It feels great that my students are gaining an understanding that the integration of technology is not for the sake of being cool or even for the sake of making class fun (although it helps with these things at times). They are coming around to realizing how the technology is changing and improving the way they learn. Infographics are a visually stunning way to deliver facts and statistics to readers. They have become incredibly popular recently on Pinterest, Twitter, and lots of other social media tools because users are looking for a quick way to get reliable information. 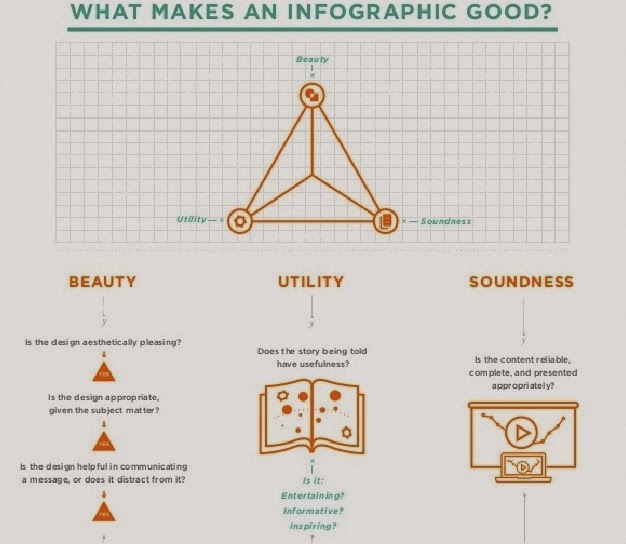 Great infographics answer questions that people are interested in answering. They also require lots of research, reading, and analysis to create. Sounds like a perfect activity for my students. How did the differences between the North and South affect each region's strategy and success in the Civil War? Next, I needed to provide the information and data my students needed to answer the question. I found a few sources for statistics: slavery statistics I received at a scholar lecture a few years ago (here is a recent article from The Root with some of the same information), documents from a DBQ my school purchased from the DBQ Project, and an excerpt from an old U.S. history text book on Union and Confederate strategy. The facts and statistics alone are not enough for my young teenage students. They also needed a few guiding questions to help them interpret the numbers and read between the lines. They also needed modeling, so I found this article on 50 great infographics that they could check out on their own. A video tutorial on what makes a great infographic wouldn't hurt either, so I threw that in too. Finally, I chose an infographic creation tool. After reviewing suggestions from edtech integration experts in my PLN like Richard Byrne and Free Technology for Teachers and Greg Kulowiec at edtechteacher I decided on infogr.am. 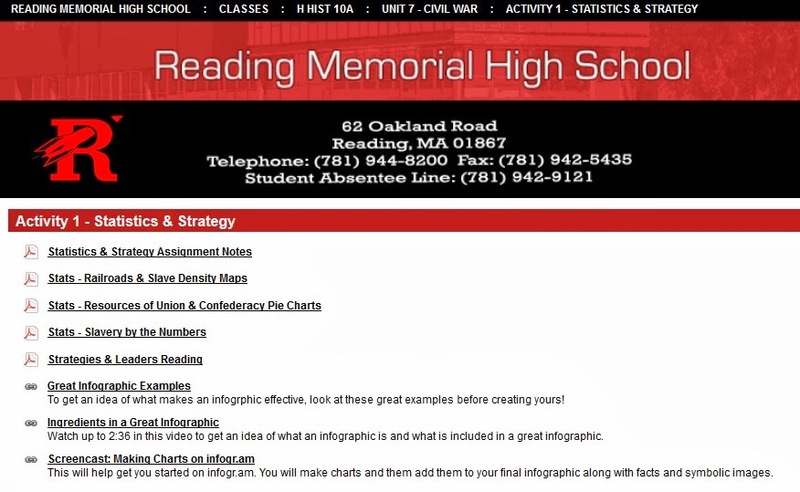 I also found a screencast on how to get started with infogr.am so that my students would have as smooth an experience as possible with the tool. However, as with all of my projects, if students have another tool they prefer that will accomplish the same goal, I'm fine with it. Process is WAY more important that product. I set up the whole lesson so that my students could access all of the information they needed in one place on our class website. This way they can easily access the resources in class, at home, or anywhere else they needed to throughout the process of completing the project. After giving them an overview of the lesson and explaining the steps they should go through, I gave students 2 full 55 minute class periods to think about the essential question, look at the statistics and data, analyze what they'd learned, and figure out infographics and infogr.am. I was in the room: sometimes at my desk helping them research using my own laptop, sometimes walking around looking over shoulders and giving impromptu suggestions, sometimes responding to raised hands. I was never directly teaching, though. Just helping them learn. After those two days in class students had 2-3 more nights at home to finish up their infographics, write a reflection, and post both to their class blog. Melanie wanted to try another infographic tool and found that Piktochart was a better fit for her. She talked about how the population statistics stood out the most to her and how there was a potential difference between slave owners and non-slave owners in the South. @KerryHawk02 That is so cool! Well done. One of the best student created infographics I've seen. @KerryHawk02 Love this. Would work well in Econ. & Social Class unit of US history. Thanks for sharing! I'm not going to tell you that the process was not without some frustration. For some students, the struggle was with the data analysis and understanding how the numbers I provided related to strategy and success in war. For others, learning a new tech tool was difficult and they had to use some trial and error. In the end, everyone accomplished the goal of learning how data can help us understand history and providing proof of this learning. Also, I think they realized that those fancy infographics they see all over the Internet don't seem so fancy after all now that they can create them too! But then what? Once the project is done, how will the world know what a monumental achievement your students have accomplished? Going paperless helps them carry it out and then share it with the world. Students learned that they would be researching an event, chosen from a list of options, and would be creating a scrapbook of primary sources. 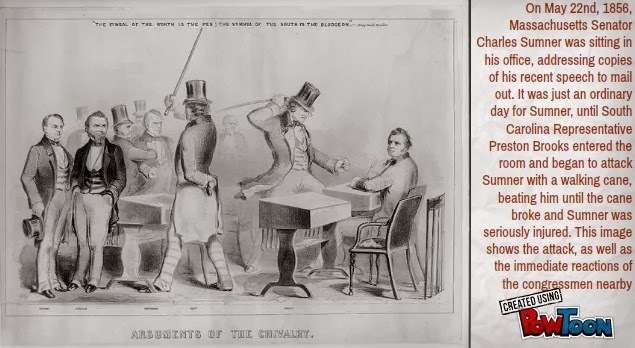 The scrapbook would start with an introductory essay and would tell the story of the event and how it increased the tension between the North and South leading up to the Civil War. They chose their small groups and topics and then started reading. 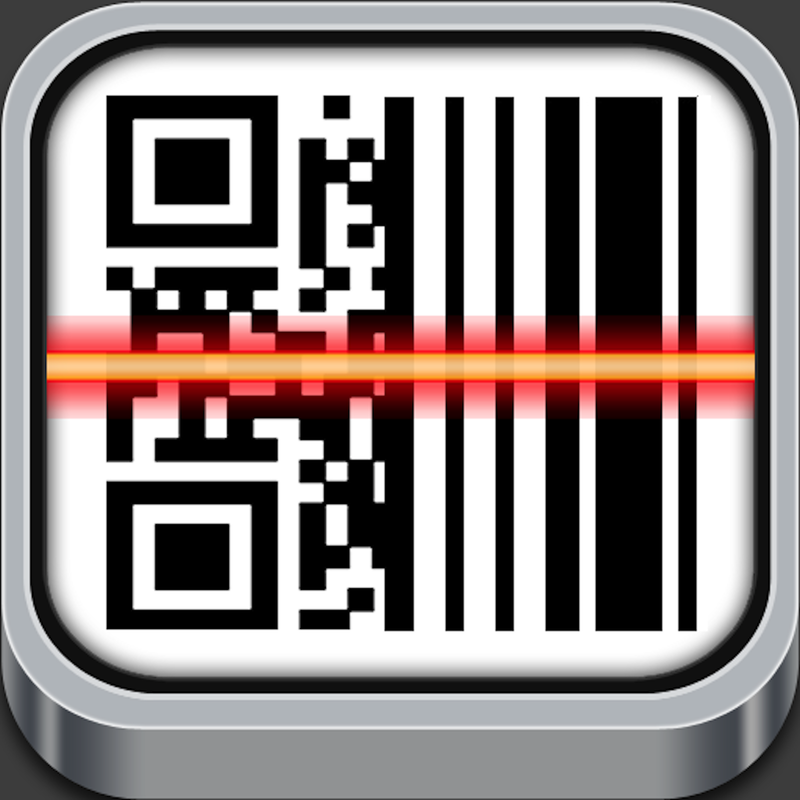 Students scanned a QR code posted in the classroom to get to a page on our class website where they could find everything they needed to carry out the project: list of topics, information on due dates, citation guide, sample projects, and even video tutorials. Research Questions: About two weeks later they had to have a detailed enough understanding of their topic to develop a thesis question and several guiding questions that their project would answer. They submitted this to me and I gave them feedback on how to make questions more or less specific, what to add or remove, and what wording to use. Project Outline: Three weeks passed and students had been reading and researching furiously outside of class. 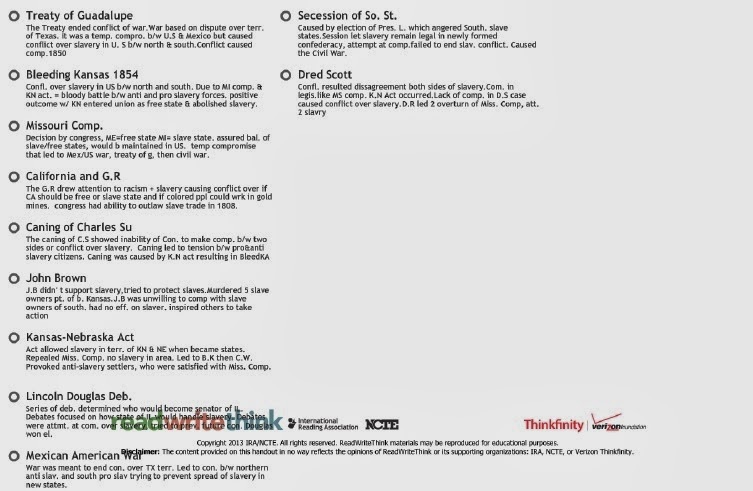 They put together an outline that mentioned the people, places, events, and resources they intended to include in their project. Once again, I reviewed their work and gave feedback. Most of the comments were helping them decide when to cut unnecessary information or add missed information. Sources and Captions: The last rough draft due date was about three weeks after the outline. This time they had to provide images of the sources they planned to include in the scrapbook with full citations and brief captions that explained each source's relevance to their topic. 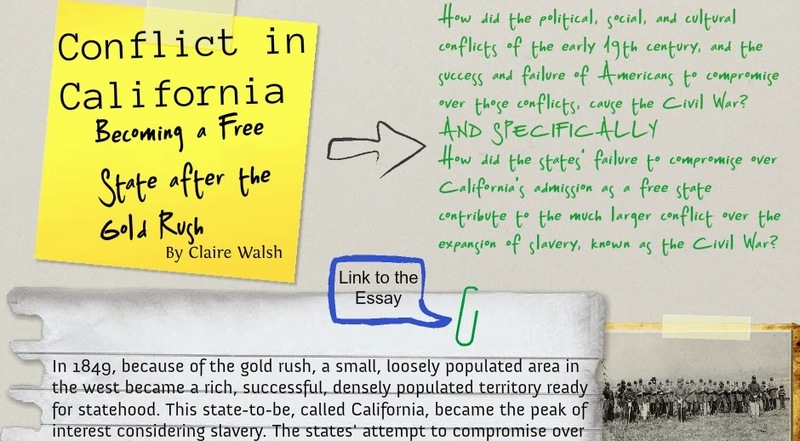 A lot of my feedback in this case was help with citation formatting and caption content that really connected to their thesis. Students put together their work in a Google Doc and added me as an editor. I was able to use the comment feature to give them feedback on particular questions or on their work overall without just editing it for them. Normally students submit all their written work on a public blog for my class, but this was a different type of assignment. It was a step along the way and wasn't meant to be a final product. Rough drafts shouldn't be on blogs. Google Docs enabled the interaction students needed with their teacher without making their mistakes public. It was time to turn in the final project complete with introductory essay, scrapbook, and bibliography. Students could create their digital scrapbook using any tool they wanted, as long as it met the requirements. Check out the samples below. They used Glogster, Prezi, Weebly, PowToon, and Google Drive. Click the images below if you are interested in seeing some sample student work. Click the image to see an example of a Glogster project. 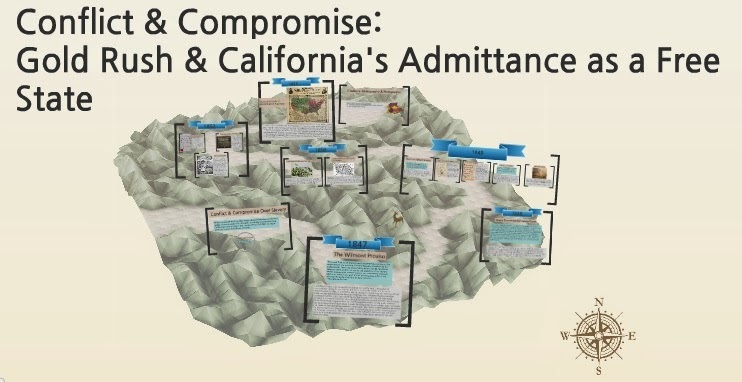 Click the image to see an example of a Prezi project. Click the image to see an example of a Weebly project. Click the image to see an example of a PowToon project. Click the image to see an example of a Google Drive project. 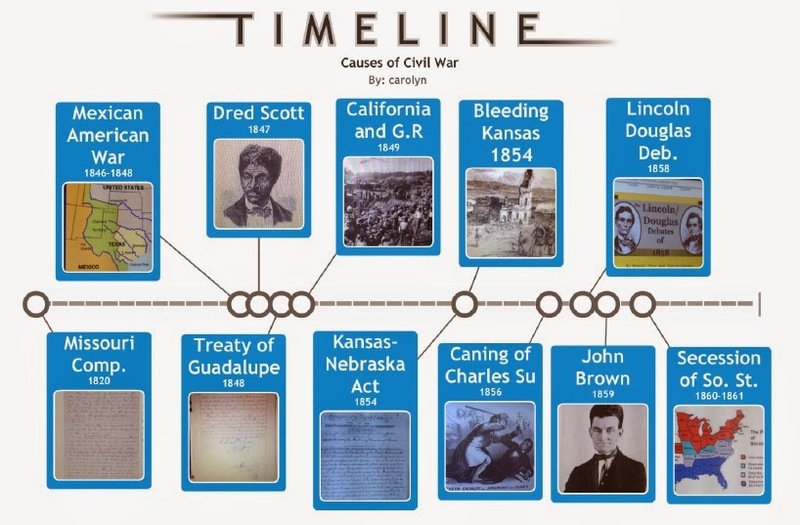 Instead of stopping here and teaching my students a unit on the causes of the Civil War so they could learn about the events they didn't research, I asked students to look through one another's work and create a timeline of the causes of war. 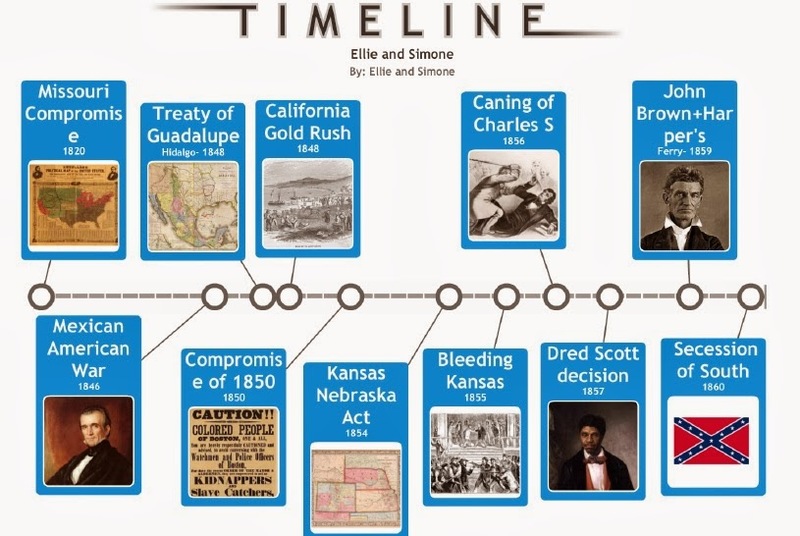 For each event their timelines included name and date of the event, a representative image from their classmate's project, and a brief explanation of the event's significance. OK, so they researched, analyzed, created, shared, and learned... but now what? How could they prove that they understood the reason behind the process? How could they prove that they had an appreciation for how they learned something because of their own hard work, rather than because a teacher had delivered the content to them? As mentioned briefly in Step 2, all student work for my class is typically submitted through a public blog. My students' blogs have therefore become a running record of everything they've learned in history class this year. So, of course, they needed to add this to their record. Paul discussed how the key to learning in this case was collaboration with classmates. Leto did a nice job reflecting on her changing attitude toward history throughout the project. Christina explained how this project served as a more intense learning experience than typical classroom units. This blog post accomplished 2 goals: they had an opportunity to reflect on what they'd learned from doing long-term deep research, and they could record what they learned so they world could see and they could look back anytime to remind themselves. I was thrilled that students were able to access all of their work throughout the process from anywhere because of the paperless elements. No one lost any research note cards, no one missed an opportunity to ask me for clarification on my feedback, and I was able to monitor their work every step of the way... even between due dates. Of course, the best part was that students learned from the process and from one another. They are slowly, over the course of this school year, realizing that they are the most valuable resources for one another in the room. I'm fading into the background and, more and more, they are taking center stage.